I have had a tough few days. It’s not the fact I was solo-parenting my kid, in a different place, whilst he was getting used to the hormonal roller-coaster called ‘Puberty’. It’s not due to the permanent anxiety trip I am on — if it’s not selling this house, or buying another, it’s secondary schools and trying to find ways of keeping my son’s (and my own) friendships alive when we move. It’s not the aches and pains of getting older. It’s my attitude that I have been fighting to change. I am altering my mind-set and in that time of self-analysis I don’t like what I see. I realise that I am my own worst enemy. Today is World Autism Awareness/Acceptance Day. 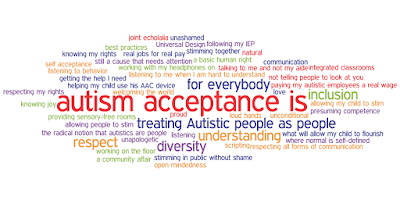 Over the last few weeks, in the build up to the month of April, I have become to realise that I am not as accepting of autism as I should be. It might seem a bizarre thing to say — I have a child who was diagnosed with an ‘Autistic Spectrum Disorder’ at the age of five. He was deemed autistic when he was born, and at the age of eleven he is still seen as autistic. Like all parent’s who have children that at some point have been given this clinical diagnosis, you could say I should be a champion of autism acceptance. However, I am not sure I am. The mental tug of war I have been having with myself is the fact I have been championing awareness and not acceptance. I have spent my time educating everyone around me about how it feels for my son to have autism, that I have been restricting his ability to say it himself. I have been battling everyone in his name, but I have been using the banner ‘AUTISM’ and not under the banner of his name. I love him and all his quirks, but I have perhaps not been as accepting of his quirks I should have been. It has only been in the last few months I may truly been seeing the child before the disability. So here is me, changing my thinking. To start I am going to change my language. My son, who I will call D, doesn’t have a condition or a disorder, he has a personality.. His personality is funny, silly, unstructured, moments of breath taking genius interspersed with periods of goofiness. He loves Minecraft and building computer games. He wants to be a scientist or a ‘Youtuber’ when he grows up. Or he might be a florist he hasn’t decided. He wants to live in an orange house, that is built into the ground, with a lab and a games room and he doesn’t want to get married to anyone — in fact he wants to live alone with his best friends visiting, but only if they go away again. He loves wearing skirts and he loves jeans. He loves all creepy crawlies, including the ones you rather he doesn’t. When we move he wants to move into the house with lots of ‘hidey-holes’ and he wants a quarter of the garden to build a huge ‘bug-hotel’. He is not a fan of busy crowded places. He loves to be squashed and tickled. He loves wrestling you. He likes to touch everything, and he hates certain smells and he doesn’t mind telling you. He hates squishy food especially banana, but he loves the fact he freaks out the waitress at the restaurant because he asks for carrot sticks instead of the chips. He has his friends and he loves making new ones. He likes school but only when they do the subjects he likes and if they stick to the timetable. He gets angry when he thinks you are being unfair and he always likes to get his own way. Normal eleven year old really. Nowhere in that description -in talking about his personality- does autism have any part of it. I have to keep reminding myself of fact. If you want to talk about his autism do it in reference to his personality and not as a condition or a disorder. He has an Autism Spectrum Personality. He is not broken, or needs to be fixed. He is not upset about his personality, he is proud of it. What upsets him, is when you don’t honour his personality — but isn’t that the same for everyone on this planet. When you don’t honour someone for the way they are, you are being disrespectful. When we were away this week, we went to ‘Techniquest’ in Cardiff. There they have a display in which a plastic ball get sucked up and then released into a series of seven inter-connecting tubes. Eventually the ball will drop into a vertical tube after following one of a series of probable routes. Due to the statistics and probability, the result is that a perfect ‘Bell’ curve is created in the experiment, with a larger amount of balls falling into the middle tubes, and then smaller amounts falling on outer edges. Anyone who knows anything about statistics, (I did do some limited statistics analysis in college, all forgotten) will know that the ‘Bell Curve’ and standard deviation is how most of the people can be determined to have … well, pretty much anything due to probability. Professor Simon Baron-Cohen, from Cambridge University is a leading researcher and he specialises in autism. He refers to this ‘Bell Curve’ and highlights that when you are talking about autistic traits, everyone will have some. You have a violent reaction to certain smells, well that could be counted as an autistic trait. You get confused by party conversation, that could also be an autistic trait. You like deep hugs because they make you feel better? are you autistic? When people refer to others in hushed conversation and make the supposed insult, ‘He’s a little bit autistic’, they fail to realise that they are in fact correct. What they also fail to realise is that you could also be referring to themselves. What we have to remember is that we are ALL a little bit autistic — this statistical analysis also allows for people who have NO autistic traits. I have yet, to meet one. What we need to remember instead, is that what we actually have in this world are ‘self-regulating’ autistics, and ‘non-self-regulating’ autistics. Self-regulating autistics, are those who understand their limitations but have been able to create tools or practise techniques that allow themselves to cope with their limitations. With their tools and techniques they can go out into the world and do what they want and need to do. They rarely need help to function in society. ‘Non-self-regulating’ autistics are either unable to understand their limitations, or because their limitations are so overwhelming, there are unable to create tools and techniques to regulate their responses and so they cant do what they want to do, or do what they need to do. They need outside help. These are the 1-100 you see quoted in the paper. Again people forget, that we label someone as ’autistic’, they are only ‘autistic’ in our society. Because they don’t follow OUR rules, we count they as having a disorder or having a condition. However, as anyone with a child who has the diagnosis, you can bet your life-savings, if your child hits an instant friendship with someone; if they reciprocate in conversation, actions and behaviours, then that other person is probably on the further end of the bell-curve as well. This weekend -before our trip to techniquest- we went to the Doctor Who Experience. D had his headphones on and his weighted backpack and with deep hugs he was coping with the crowds. Then during the tour, he helped another child fly the TARDIS, and the child - who I shall call B- fist-bumped D and D reciprocated. For the next two hours, D and B walked around the experience talking, playing and having a great time. They responded to re-direction when it was needed and although quirky in their play, they were not causing any one else issues or distress. As it turned out B’s Mother had three boys with an autism diagnosis, B was just one of them. When D asked B’s mother to have lunch with us, there were seven of us around a table. Those with a diagnosis, made the majority of our party, but there was not one issue between them. They talked, bickered in sibling angst, ate, laughed and to all intents-and-purposes, it was the same dinner many families would have experienced. However, that was because we were operating on their social constructs and NOT forcing the children to ours. We didn’t tell them to sit forwards at the table after food, because we knew it was easier for them to chat if they faced the opposite way. We didn’t batter an eyelid if one of them needed to be squeezed or had their headphones on. 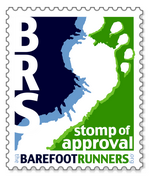 We honoured their regulating behaviours despite seeming to the outside world that they were inappropriate. They all understood why each were behaving like they were and there was no angst, just acceptance. It’s easier when I am out and about, and D displays some regulating behaviour which people would count as strange, to use the phrase, “he’s autistic” as a way to stop the stares. Every time I use that phrase, I inwardly kick myself (which unfortunately is quite a bit). I hate using it. I feel like I am saying ‘I am sorry, he’s broken’, when in fact I don’t believe either of those things. It’s a way to stop the stares and the judgements, because its easier for D to do what he needs to do to cope, if people think he's broken to do it. It’s stops them thinking I am a bad parent, or that he is a bad kid. 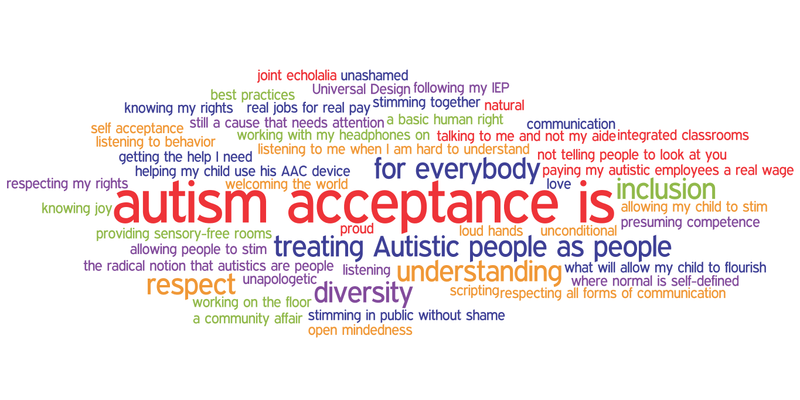 By saying, “he’s autistic”, I am making them aware of D’s personality, but I am not making them accepting of it. There was a recent yougov poll which showed that 99% of the UK population had heard of autism. Thirty-three percent of people knew of someone with the condition, yet when we talk about the outside world only four-percent had a friend with autism and only three-percent worked with someone with autism. Everyone is aware of autism, they just aren’t accepting of it. Enough already. We no longer need ‘Autism awareness’ as such — you have all heard of it. You have seen children with this diagnosis in shops and parks and restaurants. You have tutted when you saw them, or you have thought, “Poor parent, It must be so hard”. Stop tutting… we are not bad parents. Stop feeling sorry for us. There is nothing wrong with our child; all that is wrong, is your perception of our child. We all have our quirks and idiosyncrasies. We all have little habits that some find strange or repulsive. We all like and dislike different things. Do I go around and ‘tutt’ when you eat a marmite sandwich? Do I feel sorry for you because your child doesn’t like vegetables and will kick up a fuss if he is offered them at lunch? Is it wrong for me to think, “Poor parent, it must be so hard… did you see their kid? They won't use the blue crayon”? Yes it is wrong! So stop judging us and my kid! I am going to go from this point on and I am not going to give you detailed explanations on why my kid does what he does. Well I am going to try for starters. I will tell you if there is something you can do to make his life easier, if he asks — can we have a quiet area? Can we reduce the crowds? Can we have some space so he can twirl? But I am not going to offer a deep long induced monologue on how he feels, he can speak for himself. I am not going to engage with you whilst I am giving him the deep hugs or strokes he has asked for. He wants them so he can feel calmer, what does that have to do with you? Accept it. I am not going to take off his headphones in the restaurant and I will sit in silence as he eats, because he needs me to do that so he can finish his food. Accept it. I will allow him to twirl and then hide because its a way for him to relieve his stress. I won’t stop taking him to shops, or coffee shops or parties, because it makes you uncomfortable. Accept it.